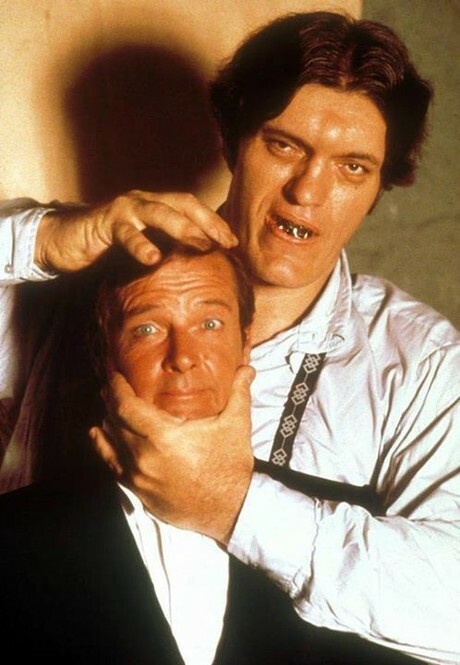 Richard Kiel, famous around the world for his classic henchman character Jaws from The Spy Who Loved Me and Moonraker, has sadly died at the age of 74. A gentle giant offscreen, Kiel, with his distinctive features and size (the result of a hormonal condition known as acromegaly), made memorable villains and baddies in a large number of film and television productions. He racked up appearances in over sixty tv shows and twenty films, defying health problems to carve out a long and successful career. He was born in Detroit and after working as a night school maths teacher and nighclub bouncer made his acting debut in a 1960 episode of Laramie. Kiel appeared in some of American television's most famous shows in the 1960s including The Monkees, I Spy and The Man from U.N.C.L.E. Who could forget his part as the giant (silent) alien Kanamit ambassador in the classic Twilight Zone episode To Serve Man? What an extraordinary physical presence Kiel was onscreen. In the seventies Richard continued to work frequently, appearing in everything from The Night Stalker to Starsky & Hutch and of course Silver Streak, a 1976 train mystery caper comedy that saw the first pairing of Gene Wilder and Richard Pryor. He's not in Silver Streak (which funnily enough anticipated The Spy Who Loved Me's train sequences) much but makes his mark. Then there was James Bond, where his stoic indestructible henchman was so popular in test screenings they decided they had to bring him back for the next film. Two different endings for the Jaws character were shot and they went for the one where he emerges from the water after the tussle with the shark to live another day. Kiel attributed his Jaws casting to a short lived television series called Barbary Coast, a sort of sequel to Wild Wild West (where Richard had also played a baddie). A casting director saw Kiel in the series and suggested to Cubby Broccoli that the towering actor would be perfect for Jaws. The steel teeth Kiel wore for the part were intensely uncomfortable and prone to make one gag if left in for too long but the discomfort was worth it as Jaws became one of the most famous and iconic characters in the history of the franchise. Jaws may typify the sort of comic excess that the more joyless and pretentious Bond fan (of which there are far too many) loves to sneer at these days but who doesn't love Jaws and Roger Moore grappling on the train or Bond using a giant magnet on him? Come on. As a child I found Jaws genuinely scary when watching The Spy Who Loved Me but it was a nice sensation. A sort of trepidation and wonder whenever Kiel appeared onscreen in that huge pale blue suit jacket and flashed that strange metal smile. Those are the memories, the sort of memories that Bond films surely don't supply to anyone these days. Reflecting on Richard's life and career these last few days, I've discovered trivia and film and television appearances I had no idea about. Like the fact that he was originally cast as The Incredible Hulk in the popular Bill Bixby television series but let go when the producers decided they wanted more of a bodybuilder type. Kiel regarded it to be a lucky escape with the extensive make-up required. I smile when I think of him sharing a futuristic car with Jackie Chan in Cannonball Run II (Jaws and Jackie Chan together!) and I always remember him in Clint Eastwood's Pale Rider too where he's this big lumbering heavy called Club who is deployed to try and intimidate Eastwood's mysterious preacher. Kiel worked a lot in the 1980s but his appearances began to thin out in the 90s when age and his health began to catch up with him. There were still appearances though in mainstream films like Happy Gilmore and even a return to the world of James Bond in 2003 for the computer game Everything or Nothing. Richard Kiel was also a frequent attendee at conventions and fan events and reading about many of these encounters today and yesterday I was struck by how everyone made a point to note what a gentleman he was. A genuinely nice person who was always self-deprecating and disarming in interviews. Rest in peace big fella and thanks for all the memories.